Sgt. 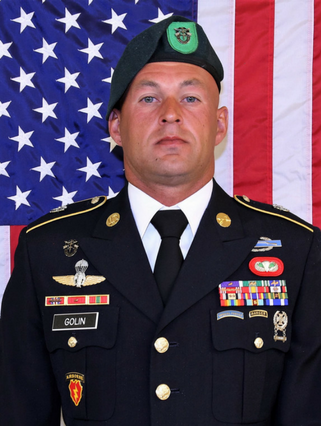 1st Class Mihail Golin, an 18B Special Forces Weapons Sergeant assigned to 10th Special Forces Group (Airborne), died Jan. 1, 2018, as a result of wounds he sustained while engaged in combat operations in Nangarhar Province, Afghanistan. Golin was born in Riga, Latvia, Aug. 20, 1983. He moved to the United States in October 2004 and enlisted in the U.S. Army from Fort Lee, New Jersey, Jan. 5, 2005. After completing basic training and advanced individual training, Golin was assigned as an 11B Infantryman with the 3rd Battalion, 509th Parachute Infantry Regiment, 4th Infantry Brigade Combat Team (Airborne) at Joint Base Elmendorf-Richardson, Alaska. Following his assignment in Alaska, Golin volunteered for Special Forces training and graduated from the Army’s Special Forces Qualification Course in November 2014. He was then assigned to 10th SFG (A) as a Special Forces Weapons Sergeant. Golin deployed to Afghanistan in September 2017 with the 2nd Battalion, 10th SFG (A) in support of Operation Freedom’s Sentinel. Golin’s awards include the Purple Heart Medal with one oak leaf cluster, Army Commendation Medal with two oak leaf clusters, Army Achievement Medal with two oak leaf clusters, four Good Conduct Medals, National Defense Service Medal, Global War on Terrorism Service Medal, Valorous Unit Award with two oak leaf clusters, two Non-Commissioned Officer Professional Development Ribbons, Army Service Ribbon, Overseas Service Ribbon, NATO Medal, Special Forces Tab, Ranger Tab, Combat Infantryman Badge, Expert Infantryman Badge, and the Parachutist Badge.